Brussels/Namur (E411), in Courrière take the N4 direction Marche en Famenne, after Marche take the exit 'Waha' towards La Roche en Ardenne (18km). Arrived in La Roche on the Place du Bronze, leave the place on your left hand and take to the right the Ortho/Bastogne direction. 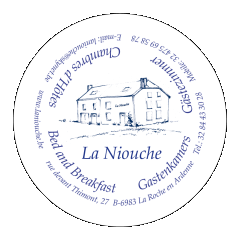 Climb in wood and at ± 6 km you will find “La Niouche”, only house on the right side of the road.